saying they have a warrant to hold him. Furthermore, the attack to his Abuja home will stay until the point that the administrator surrenders himself. The police faulted cases by Senate President Bukola Saraki that the police did not submit a letter inviting Melaye to the National Assembly Clerk. Melaye is wanted for criminal conspiracy and attempted culpable homicide said to have been committed on July 19, 2018. 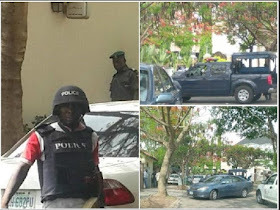 On the date, the police accused Melaye and his armed thugs of attacking police personnel; shooting and wounding Sgt. Danjuma Saliu, attached to 37 Police Mobile Force (PMF) on a stop and search duty on Aiyetoro Gbede, Mopa Road in Kogi State. Force spokesman Jimoh Moshood, an acting Deputy Commissioner of Police, said the siege was a worldwide practice to ensure wanted criminals are arrested. Moshood showed copies of a letter of invitation sent to the National Assembly Clerk, the medical report of the injured police officer and the pictures of the officer to serve as proof. The letter to the clerk was dated July 23, 2018 and it was signed by Commissioner of Police, Kogi State Command, Ali Janga. The letter was received on July 23, 2018 by the office of the Clerk of the National Assembly. The letter reads in part: “This office is investigating a case of criminal conspiracy and attempted culpable homicide reported against Senator Dino Melaye representing Kogi West. The medical report of the injured police officer, Sgt. Danjuma Saliu, from the Federal Medical Centre, Lokoja, was signed on July 31, 2018 by Dr. Aduloju F.A. on behalf of the consultant-in-charge of Cardiothoracic Surgery Unit. Moshood said the police officer was yet to recover from the gunshot injury he sustained during the attack and still under intensive medical care in the hospital. The police said they would ensure a thorough investigation into the matter for the rule of law to prevail, adding that no suspect, no matter how highly placed, involved in any criminal matter will escape justice. On why it took several months to attempt Melaye’s arrest, Moshood said: “The incident happened on July 19 and we sent a letter of invitation to the Clerk of the National Assembly on the 23rd and it was acknowledged on the 24th. “The investigation police officer that dispatched the letter was present when the Clerk handed over the letter to Senator Dino Melaye and since then, we have been out to get him arrested. “Seeing the presence of police at his residence does not mean we just started. He has been evading police arrest and we have been able to narrow him down to his residence and those there will not retreat until he surrenders himself for arrest because nobody is above the law. 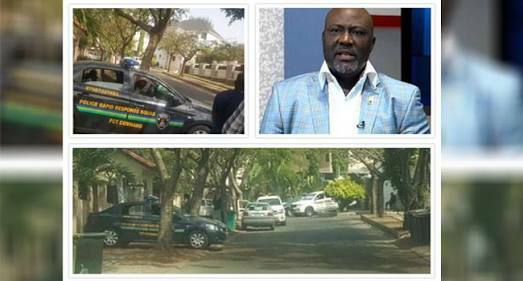 On why the police decided to lay siege to Melaye’s residence, Moshood said: “It is worldwide practice. Even in other climes, police vehicles are used to cordon off the premises and sometimes, they even use helicopter to do surveillance to track down wanted criminals."